I was looking through my file server the other day and stumbled upon an old folder containing 3DMark 2000-Vantage screenshots I made back in 2007-2009 (I had too much free time back then ). I'm only going to post the 3DMark2001 shots here, since IMO 3D'01 is by far the most interesting benchmark. I still own most of these machines, though many of them run different hardware and software than they did back in 08. If anyone wants to see the 03-Vantage scores of any of these rigs, please tell me! I'll post different categories (eg: 9800Pro w/ different CPUs) as replies to the original post. Last edited by Standard Def Steve on 2014-7-10 @ 07:12, edited 4 times in total. With two 8800GTS in SLI. Kinda interesting how the DX7 game tests are actually slower with SLI. When you run 3DMark2001 on almost any GPU produced in the past ~7 years, the CPU is actually mostly what is being benchmarked. Last edited by Standard Def Steve on 2014-3-29 @ 05:52, edited 1 time in total. Last edited by Standard Def Steve on 2014-5-05 @ 08:07, edited 4 times in total. Pentium III 1000EB using the i815 integrated graphics (benchmark was not run using default settings: had to use 16-bit color). Core 2 Duo T5600 (1.83GHz/667FSB) using GMA950. It actually manages to outperform the Celeron 900/Radeon 9800Pro a few posts above! Last, but not least, a Pentium III 1000EB paired with a Radeon x800XT. That's it for me, but feel free to post your own 3Dmark 01 results if you'd like! The performance of of the Pentium M (Dothan) is really incredible. I got the 2Ghz Version in my old laptop paired with mobility radeon 9600 and it can still run quite a few games. Here are some of mine, no images sorry. Same PC but with a Radeon 3650 512mb. Radeon 7200 32mb DDR (cannot seem to find the exact model on the internets). I don't have my PIII-S machine running at the moment as I need some new fans for my voodoo... but in the mean time I decided to bench my everyday machine. I can get higher scores if I go to benchmark mode and stop unnecessary programs, fiddle with LOD bias and what not... but I didn't feel like it. C2D E8500 @3.8ghz , DDR2-1066, GTX-580, stock settings. elfuego wrote: The performance of of the Pentium M (Dothan) is really incredible. I got the 2Ghz Version in my old laptop paired with mobility radeon 9600 and it can still run quite a few games. Yeah! I still wonder why Intel didn't make a S478 version of Dothan back when AMD was slaughtering the P4. mwdmeyer wrote: Here are some of mine, no images sorry. I've always wanted one of the XPS B systems, but all I can find around here are XPS T's and Dimension 4100s. RoyBatty wrote: C2D E8500 @3.8ghz , DDR2-1066, GTX-580, stock settings. Very interesting. This makes me want to do an XP vs Win7 comparison run. I would've thought a 3.8GHz C2D+GTX-580 would smoke my old S939 Opteron system. The P3-550 w/ GFFX result is actually kind of impressive. I wouldn't expect even 1000 marks from early P3s or even late P2s. How would that same FX5200 fare in a 66MHz FSB PC100 RAM'd PII? k6-2+/550, geforce2 mx200, around 1060 points (default setting of course). Atom N470 at 1.83GHZ, GMA3150. Interesting how much slower it is than the GMA950 above. Here's (very slightly overclocked) Atom N270 with i945 @ native resolution (1024x600). If the standard resolution is used, the score drops to 2684. I've found that some games don't recognize the DirectX 8/9 features of the GMA 9xx. The drivers are the likely culprit. In fact Morrowind is one of them, and Max Payne 2 as well if I remember correctly. My EeePC 900 has GMA 900 so I've experimented a bit. It is pretty slow though, kind of like a Geforce 2 GTS with DX9 features. It only has single channel DDR2 400 and it's the lowliest chipset (910GML). A GTX 580 paired with a Core 2 Duo? Jesus, that must be a hell of a bottleneck. Win 7's DX7 performance appears to be lower than XP's. 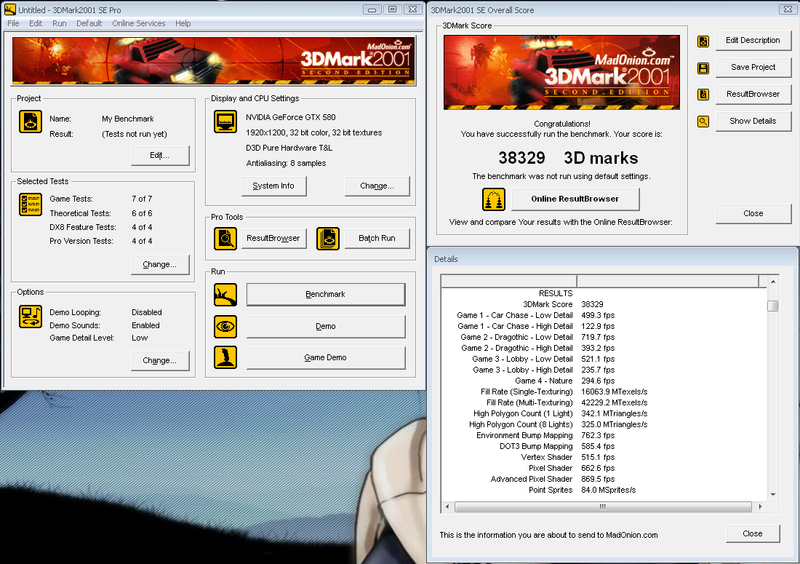 DX8/9 performance is much better; 3DMark03, 05, and 06 scores were a lot closer together. 3DMark05's CPU test was actually 900 points higher on Windows 7 and ran noticeably quicker. BTW, this actually surprised me - the i945 has some pixel shaders (at least DX 8.1) - I never knew it could run Nature test and advanced pixel shader so nice. The Core 2 Duo is definitely a much faster processor than Atom, but I thought that both systems would be GPU-limited with such slow IGPs, even in 3DMark01. Yeah, GT4 Nature runs very well on i945. On the C2D system, it's over twice as fast as the FX5200! 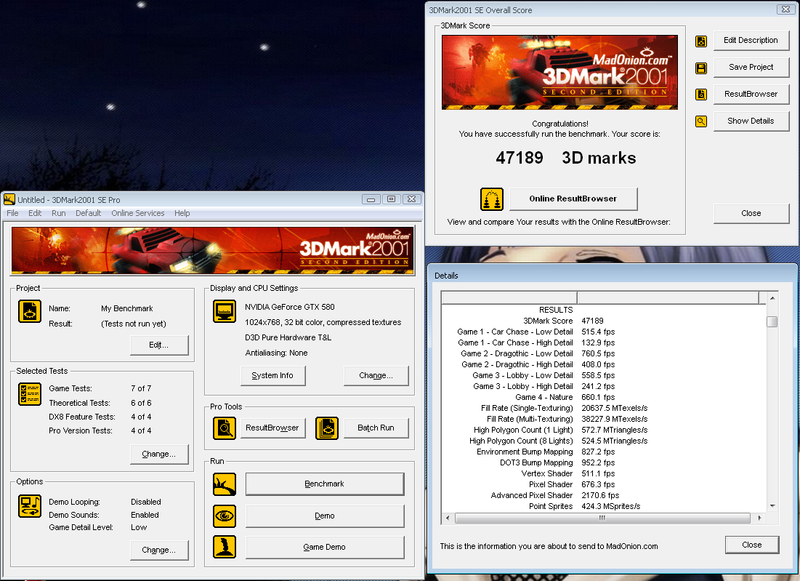 The GMA950/C2D also outperforms the FX5200 in 3DMark03 and 05. Will do another benchmark once I get my 700/1MBs running. Also scored an uber cheap FX5500 on ebay, will test that later as well. Interesting fact is that replacing those Xeons with Tualatins 1.4 would literally triple the result.